WHO SAYS IT'S ALL ABOUT THE DOWN WITH VIEWS LIKE THIS? 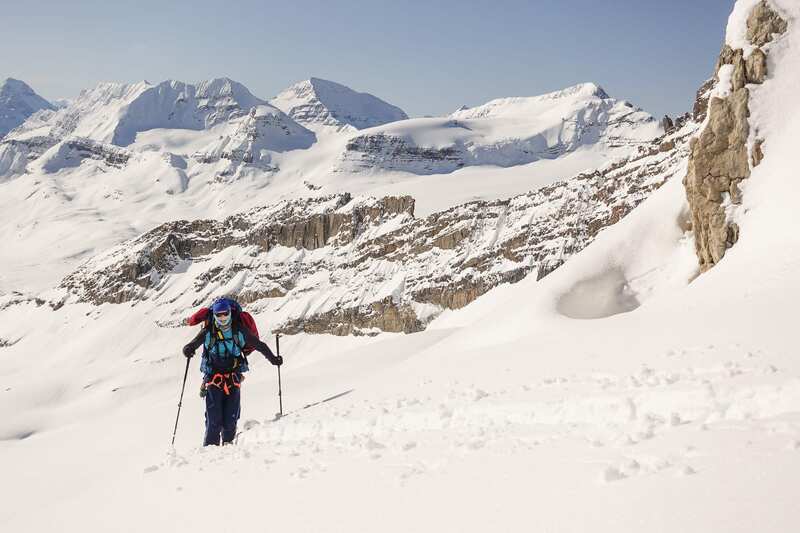 We’ve been offering incredible mountaineering and ski touring trips for over 20 years. Here’s a look at some of the great ski trips we’ll be offering for the 2019/20 season. 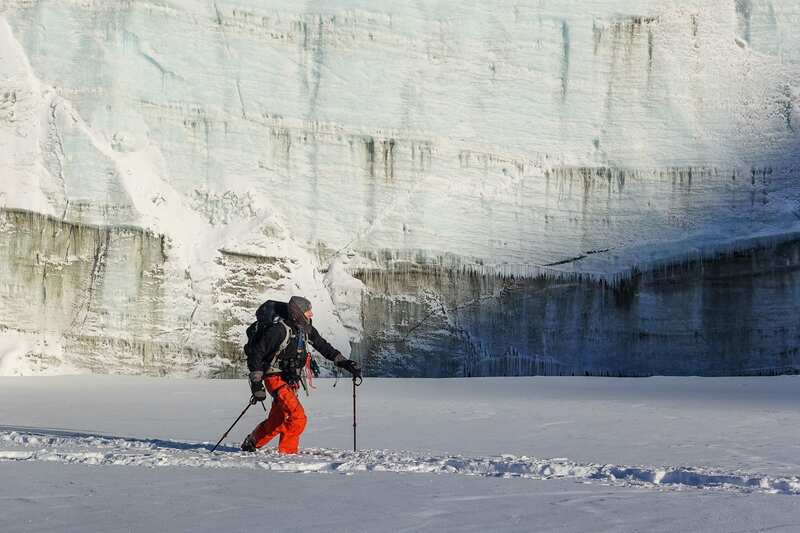 The most exotic guided ski touring trip possible: backcountry ski touring and sailing along the west coast of Spitsbergen in the Greenland sea, a thousand kilometers north of Norway, in the Svalbard archipelago of over 60 (mostly unpopulated) islands. It is a wild and remote place, and at a latitude of greater than 78º, high in the Arctic, it is level with Canada's Ellesmere Island, or the northernmost end of Greenland. Yet it easy to access -- with three-times daily flights from Oslo -- and offers the supreme comfort of a luxury sailing yacht. Booking for 2020 & 2021! 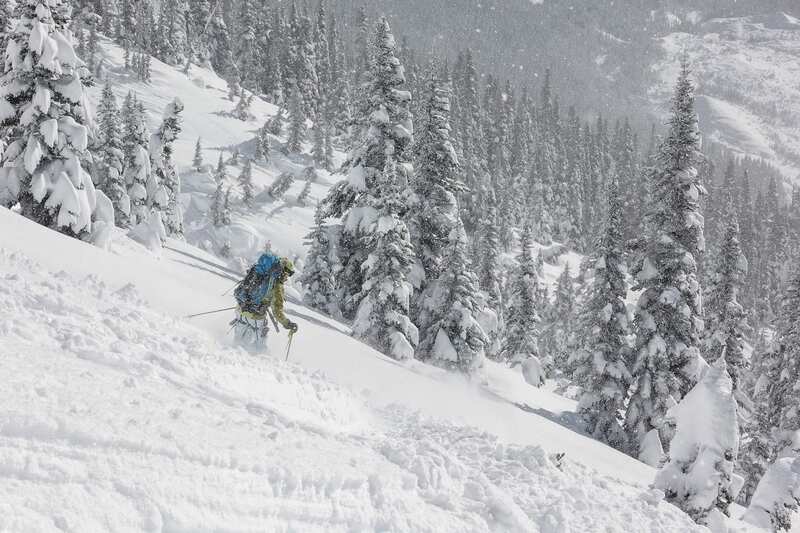 - Selkirk Lodge provides exceptional access to an endless variety of tree skiing and big glacier runs providing excellent backcountry skiing and snowboarding options. Sitting at 2,165 metres (7,100 ft) on a small sub-alpine knoll, Selkirk Lodge enjoys grand views of high summits, nearby ice fields and the deep wild valleys of the Albert Range of B.C.’s Selkirk Mountains. We are the Wapta Deluxe experts. For years we have offered the very finest Bow Yoho traverses. Our clients have confirmed that this is the closest you'll get to a luxury Euro-style traverse in Canada and certainly on the Wapta. Find out why! Book now! Just 5 spots left -- book now! Japan has formed a legendary reputation for deep powder skiing in January and February. The saying "Don't Leave Powder to Find Powder" is common in western Canada - why leave Canada when we have the best skiing in the world? Well, Japan is a strong contender, and when you add the incredible cultural experience to the mix it rises to the top of any serious skier's bucket list. We are offering three ski and sail trips during the prime season for Arctic ski touring. The most exotic guided ski touring trip possible: backcountry ski touring and sailing along the west coast of Spitsbergen in the Greenland sea, 2000 km north of Norway, in the Svalbard archipelago of over 60 (mostly unpopulated) islands. It is a wild and remote place, and at a latitude of greater than 78º, high in the Arctic, it is level with Canada's Ellesmere Island, or the northernmost end of Greenland. Yet it easy to access -- with three-times daily flights from Oslo -- and offers the supreme comfort of a luxury sailing yacht. This is the Classic Wapta traverse Euro-style with portered food and luxury details -- but no crowds. An excellent hut system, perfect terrain for traverses, and easy access to excellent ski mountaineering objectives. In early May the snowpack is settled and the travelling is easy, with great corn skiing runs and great snowpack stability. Vallhalla Mountain Lodge was built in 1987 before most other backcountry lodges in the Koots were imagined. Best terrain, epic snow fall and perfect temperatures = heaven! Sawback was founded by Tom Wolfe in 1995, running mountain hiking trips for groups. Since then we have expanded programming to offer just about any mountaineering adventure you could imagine. Tom is a trained and internationally certified Mountain Guide and a member of the Association of Canadian Mountain Guides (ACMG) and the International Federation of Mountain Guides (IFMGA). We work with a variety of other certified guides. See our Guides and Partners Page for some photos and brief bios. For existing trips, simply use our Book Now link to fire off a quick booking request. We will follow up quickly with you to confirm the booking with you. If you are looking for a custom trip – e.g. a day of ski touring or ice climbing or a multi-day trip that we don’t offer – email or phone us or use our contact form. We will offer suggestions and personally help you organize the best possible trip for you . Are you a guide’s service? Sawback is primarily a small one-man operation. While there are guides who work with large operations in Western Canada there is also a small, co-operative community of independent guides who pass work they can’t do on to others who can. If Tom can’t join you in your mountain adventure we will refer you to another independent mountain guide who will.